This week, my guest is Brad Currie. Brad is a vice principal for the Chester School District in Chester, NJ. He is also the co-founder and co-host of a weekly Twitter discussion for current and emerging school leaders called #satchat. 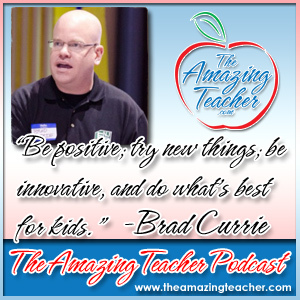 Brad is also the first school administrator who I have had as a guest on the podcast. I found Brad on Twitter a couple of years ago after he shared one of my SuccessInTheClassroom.com post on Twitter. At the time, it was one of the first – or maybe even THE first time – one of my posts was shared. It was pretty cool, so since then, I’ve been following Brad. I was very pleased when Brad agreed to be on the podcast. I knew that from his position as school administrator, he would be able to share his unique perspective on the teaching profession with my audience. I especially wanted to ask him about one of his most popular posts, Ten Reasons Why I Should Hire You. 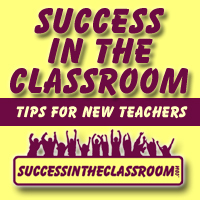 This episode is full of amazing tips and words of wisdom for new and soon-to-be teachers. As with many of the previous guests, building and maintaining positive relationships is very important to Brad, especially when hiring a teacher. 1. Maintain positive relationships with all school stakeholders. 2. Provide autonomy – freedom to students, allowing them to explore the subject area in whatever way is most important to them. 3. Contribute to the school culture in more ways than one. 4. Are always getting better, always trying out new things and finding a different way to have an impact in class. It was great Skyping with Brad for the podcast. I know that you will find his insights on teaching as inspiring as I did. Thank you again for spreading the word about The Amazing Teacher Podcast!